I have written a great deal about the abuse of this country’s indigenous People, and also about the travesty that was the Holocaust. This sobering guest article, first published on the website of the Indian Country Today Media Network, links these two blots on the history of humankind. I first presented this post in 2015. It was over seventy years ago that the imprisoned and starved and viciously battered victims of Hitler and his Nazi thugs were liberated by Soviet troops. 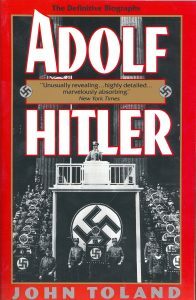 Hitler—the coward, who’d later commit suicide rather than face the music—was incontrovertibly one of the world’s most brutal and bloodthirsty bastards to ever walk the globe. Yet, little is it known that he was also a plagiarizer. The idea of a prison camp—specifically Auschwitz, in Oświęcim, Poland—where Hitler’s soldiers could shoot, hang, poison, mutilate and starve men, women and children en masse was not an idea Hitler, the bigot, came up with on his own. In fact, the Pulitzer-Prize winning biographer John Toland wrote that Hitler was inspired in part by the Indian reservation system—a creation of the United States. 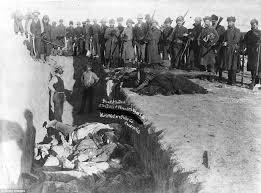 This infamous genocide occurred at Wounded Knee Creek, South Dakota, in 1890. Now, of course, it is not in the best national interest of the U.S. to recognize such a realization as presented by Toland. As I’ve said time and again, you cannot be the greatest nation in the world if you’re guilty of genocide—and especially if your country’s policies were the inspiration that engineered one of the world’s most devastating genocides. And, of course, the evidence is readily available to those who’d seek it that European settlers (i.e., invaders who would later divorce themselves from their motherland, renaming each other “Americans”) did, in fact, set into motion a detailed template—justifications (Divine Right), policies (Indian Removal), procedures (Wounded Knee)—for Hitler to follow. Now, of course people are wont to argue that plague and disease killed Native Americans in great numbers, which is true—Native Americans did die in mass numbers as a result of European pestilences and our biological inability to fight off these foreign microbes. But that argument inherently ignores the well-documented extermination policies set forth by the United States. In fact, President Thomas Jefferson himself famously said (well, famous throughout Native America) that the “(American Indian has) justified (their own) extermination.” And it was George Washington who thought the only way to kill Native Americans was to wage war on their crops. A mass grave at the Bergen-Belsen concentration camp. There are many similarities in the United States’ attempt to exterminate Native Americans and Hitler’s attempt to exterminate the Jews. Both groups were—and in many ways remain—dehumanized. Both are and were considered to be in the way of so-called progress. In the U.S., officials and citizens even coined it the “Indian problem,” and Hitler famously considered Jews exactly that, his problem, and he charged himself—much like President Andrew Jackson—with the responsibility of eliminating that problem. The irony here is, days prior she signed her name to two resolutions recognizing the Jewish Holocaust and the Armenian genocide. 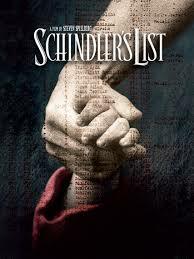 Steven Spielberg, director of the Holocaust film Schindler’s List, said in speech at an event [recently] that the Jewish people are once again threatened by “the perennial demons of intolerance,” Joanna Berendt of The New York Times reported. “People want to, all over again, strip you of your past, of your story and of your identity,” he said. Spielberg’s statement applies to Native Americans as well, who are now 1.7 percent of the total U.S. population (new estimates argue that the population of indigenous peoples in North America was as high as 123 million prior to European contact).